Posted in: Radio Control. 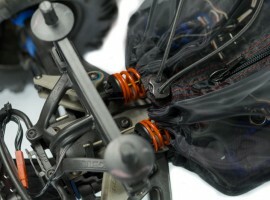 Tagged: Accessories, New Releases, Racing, RC. A Universal Shroud is the latest offering from Dusty Motors. The Shrouds are splash proof and made from breathable material which allows air flow in order to keep your electronics cool. Dusty Motors shrouds are famous for their zipper, which allows you to access your batteries and electronics without having to remove the shroud. The Universal Shrouds are available in 6 different sizes designed to fit 1/16 to 1/18 scale. 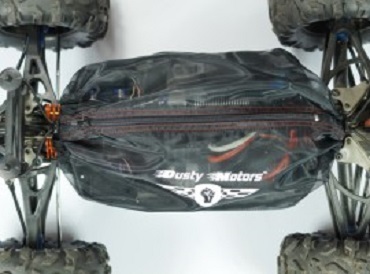 Dusty Motors makes a wide variety of vehicle specific shrouds and the universal shrouds were designed to help cover a bigger variety of vehicles. For more details check out DustyMotors.com or check out the Dusty Motors videos below. If you have a vehicle that isn’t waterproof and you enjoy or want to do some winter running, then you really should consider a Chassis Shroud. Check out our previous post on Chassis Shrouds.